SAN JOSE, California, March 15, 2019 /PRNewswire/ — Huawei Technologies, a leading global information and communications technology (ICT) solutions provider, today announced plans to adopt Open Rack in its new public cloud datacenters worldwide. The move is designed to enhance the environmental sustainability of Huawei’s new public cloud datacenters by using less energy for servers, while driving operational efficiency by reducing the time it takes to install and maintain racks. The Open Rack initiative proposed by the Open Compute Project (OCP) seeks to redefine the data center rack and is one of the most promising developments in the scale computing environment. It is the first rack standard that is designed for data centers, integrating the rack into the data center infrastructure, a holistic design process that considers the interdependence of everything from the power grid to the gates in the chips on each motherboard. Adopted by some of the world’s largest hyperscale internet service providers such as Facebook, Google and Microsoft, Open Rack is helping to lower total cost of ownership (TCO) and improve energy efficiency in the scale compute space. “Huawei’s engineering and business leaders recognized the efficiency and flexibility that Open Rack offers, and the support that is available from a global supplier base. Providing cloud services to a global customer base creates certain challenges. The flexibility of the Open Rack specification and the ability to adapt for liquid cooling allows Huawei to service new geographies. Huawei’s decision to choose Open Rack is a great endorsement!” stated Bill Carter, Chief Technology Officer for the Open Compute Project Foundation. As well as Huawei’s adoption of Open Rack in its cloud datacenters, the company is also expanding its work with the OCP Community to extend the design of the standard and further improve time-to-market, and high serviceability and reduce TCO. Last year Huawei became an OCP Platinum Member. This year, Huawei continues investment in and commitment to OCP and the open source community. 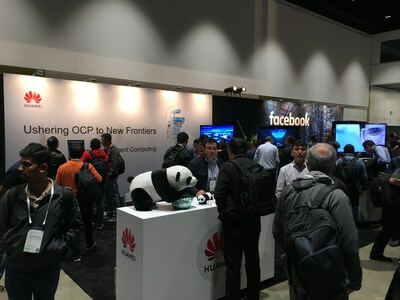 Huawei’s active involvement within the OCP Community includes on-going participation and contributions for various OCP projects such as Rack and Power, System Management and Server projects with underlying contributions to the upcoming specs for OCP accelerator Module, Advanced Cooling Solutions and OpenRMC. During a keynote address at OCP Global Summit, Huawei will share more information about its Open Rack adoption plans as well as overall OCP strategy. Huawei is also planning to showcase some of the building blocks of these solutions in its booth, including OCP-based compute module, Huawei Kunpeng 920 ARM CPU, Huawei Ascend 310 AI processor and other Huawei intelligent Compute products. Huawei is a leading global provider of information and communications technology (ICT) infrastructure and smart devices. With integrated solutions across four key domains — telecom networks, IT, smart devices, and cloud services — we are committed to bringing digital to every person, home and organization for a fully connected, intelligent world.